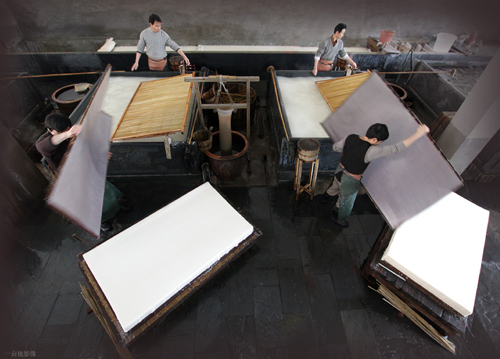 With more than 1,000 years of history, beginning in the Tang Dynasty (618-907), Xuancheng has always been the best place for the production of Xuan Paper. The name “Xuan”, as you can see, comes from the name Xuancheng. The raw materials used in the production of Xuan Paper are the bark from green sandalwood, which is found in the mountainous regions of Huizhou, and the straw made from rice grown on sandy land. Following 18 different procedures, including rubbing, steaming, starching, soaking in water, pasting, drying and so on, the white, soft and durable paper is finished and ready for sale. Xuan Paper is mothproof and mould-proof, resistant to ageing, very tensile and invariably white in colour. So it is often referred to as “the king of paper” and “the millennial longevity paper”. Xuan Paper can be divided into two categories – Natural Xuan and Vitriol Xuan. Natural Xuan is used for the kind of freehand brushwork found in Chinese paintings and calligraphy, whilst Vitriol Xuan is more suitable for Chinese paintings with realist technique.